Clippity Clop and Merry Christmas — Don’t Miss the Horse-Drawn Carriage Rides in Historic Hillsboro-West End This Weekend! 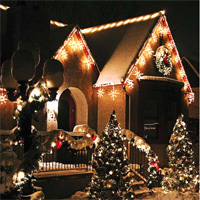 Outdoor Lighting Perspectives of Nashville wants to invite everyone out to enjoy a horse-drawn carriage ride December 6th 7th in the historic Hillsboro-West End neighborhood to view the holiday lights! We are proud to be part of the festivities this year as we installed the temporary landscape lighting in honor of the occasion. Come one, come all to enjoy the magic of historic Hillsboro-West End in all its holiday splendor as a festive 30-minute clip-clopping tour takes you past lovely, decorated homes, many built in the 1920’s. In addition to the horse-drawn carriage tours there will also be live music,caroling, refreshments and hot cider! 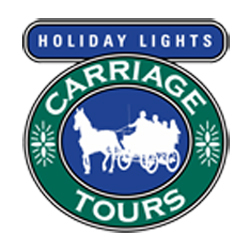 Carriages depart every 30 minutes beginning at 4:30 PM with the last tour beginning at 8:00PM. Tickets are $22.50. Children under 2 who sits on an adult’s lap ride free. Of the ticket price, $18 is tax-deductible. Tickets available for parties of 12 or more for $20 offered only for the 7:30 pm and 8 pm rides each night. Call 593-5259 for availability or visit their website at http://www.hwen.org/tour. Outdoor Lighting Perspectives of Nashville provides temporary and special event lighting for celebrations and special occasions such as weddings, outdoor proms, graduation and birthday celebrations, family reunions, residential and commercial or corporate outdoor (and indoor) events you have planned. Our large selection of fixtures, including festival lighting and LED lighting combine with our experience in utilizing unique lighting techniques enable us to create an atmosphere that embraces the moment perfectly! Are you having an outdoor prom, wedding, graduation party, cookout or other really special event? If so, you’ve probably considered outdoor lighting for the event. Have you wondered if it’s possible to get great quality event lighting for a one-time event? With a resounding yes, Outdoor Lighting Perspectives of Nashville provides temporary outdoor lighting for events and special occasions. 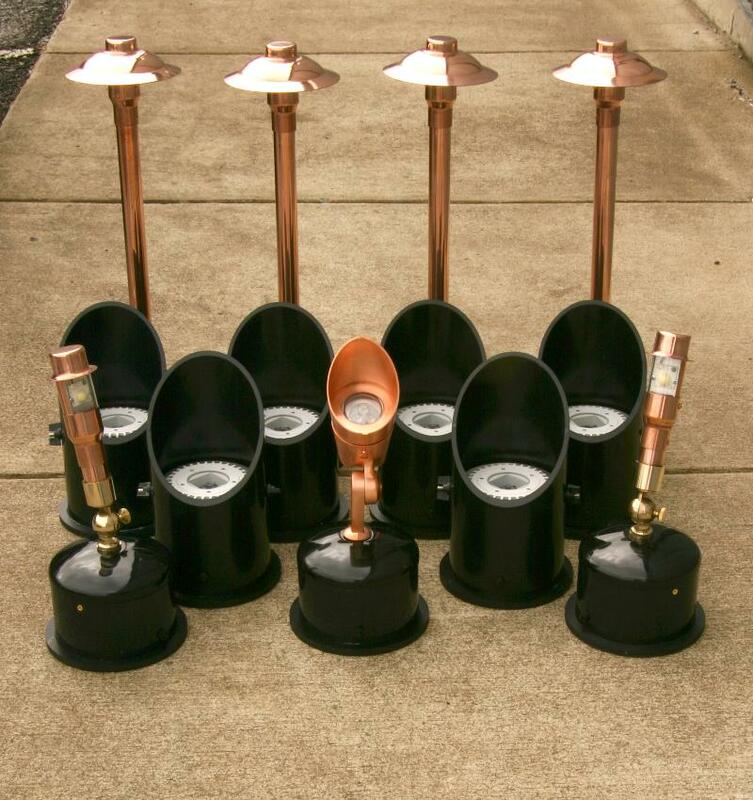 We have a variety of outdoor lighting fixtures available for temporary use or permanent installation. Our fixtures are also available in LED. One thing our customers tell us time and time again is how much more they and their guests use their back yards once they add outdoor lighting. “It’s like that part of my yard doesn’t existing at night because it’s not lit up at night”. For an outdoor party, this is even more important to consider. You don’t want your guests on top of each other when there’s plenty of room and good lighting couple open up that area for use. Consider an outdoor event under a tent. If only the tented area is illuminated, everyone will stay under the tent. But, perhaps there’s an adjacent gazebo or patio which could double as a dance floor. Lighting up those areas will allow and encourage some guests to use those areas thus essentially adding space to your event location. We’ve all seen them. We’re positively giddy when we attach the digital camera cord to the computer the next day and there they are – super dark pictures that are essentially useless. Good outdoor lighting renders colors and images in a way similar to how they are seen during the day. If it’s a wedding, imagine the difference between outdoor evening photos with good illumination and without. If you’re having a family reunion and likely won’t see these relatives again for many years, you want to capture all of the pictures. Good lighting will help make this possible. Let’s never forget safety. Grassy areas hold numerous pitfalls for traversing add night. Add high heels to the equation and it could be even worse. But traversing grass and bumpy surfaces such as a cobbled walkway can be very safe if properly illuminated. Better illumination of the entry path and the party will enhance the safety of all your guests in the evening. Do you own a facility that hosts outdoor evening events? Lighting commercial venues with permanent outdoor lighting is one of our specialties. Give us a call for a free estimate on either temporary or permanent outdoor lighting for your outdoor entertainment venue. 615-373-0638. 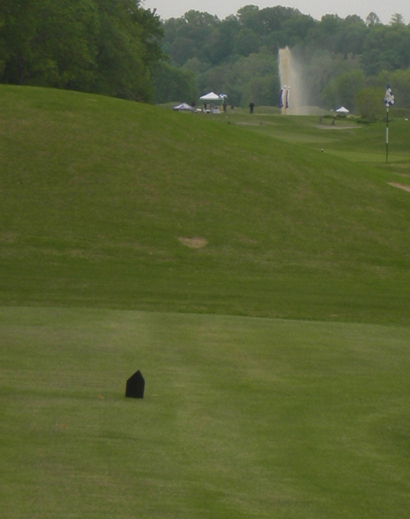 Last week we attended the CAI Nashville golf tournament Luau Golf Scramble at Gaylor Springs Golf Course here in Nashville. We all thoroughly enjoyed ourselves. We sponsored the straightest drive contest and had a nice tent where we met lots of great property managers around the Nashville area. In fact, some of the CAI members were already customers of ours and didn’t realize that we do commercial outdoor lighting. We do! After the event, we were asked by several CAI members to do a consultation. These were for traditional outdoor lighting but also for parking garage and parking area lighting. 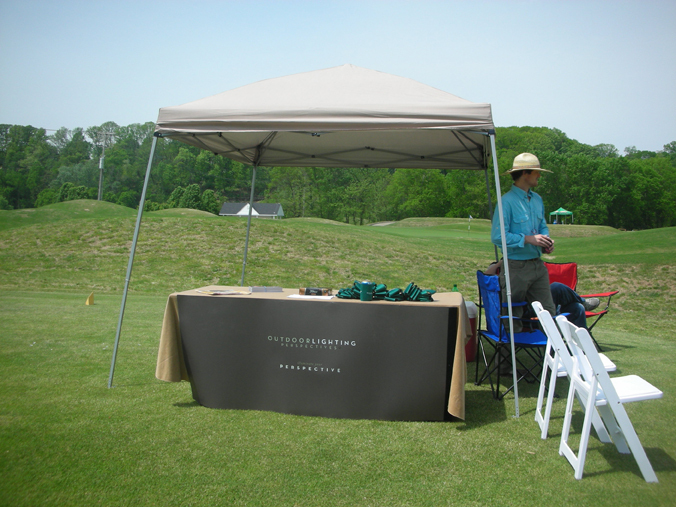 Here was our booth at the golf tournament. 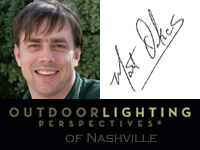 The good thing is that Outdoor Lighting Perspectives of Nashville hasn’t just been in our market for over 20 years, but we are the manufacturer for all of the other Outdoor Lighting Perspectives offices around the country. We have a tremendous amount of flexibility with our fixtures to not only custom design a solution but sometimes to even create a customized product. We have the ability to powder coat our fixtures to match the various applications. Some of the CAI members we spoke to just wanted to know what we do. Essentially, there are 3 main aspects to what we do. We are a design company first. You give us a blank canvas and tell us what you want and we will design the outdoor lighting for your needs. Finally, we are a service company. We service our systems and we service other systems. We have 2 full-time service vans. You may have seen them around town. And we’re bringing on another service van to keep up. We customize all of our service packages for your needs whether they be monthly, quarterly, or yearly. We also do holiday lighting. It’s definitely not too early to start thinking about holiday lighting. 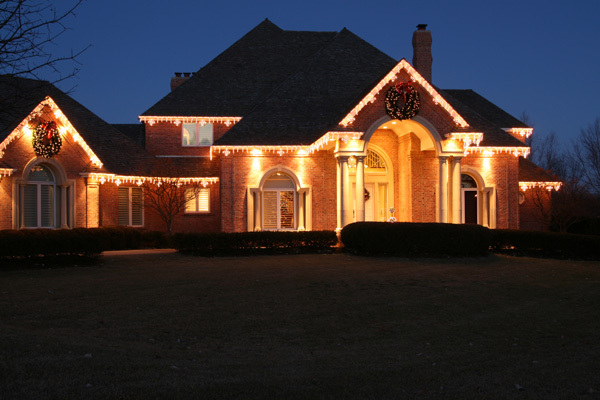 Unlike other holiday lighting companies, we offer property managers something a little different – we design, install, and store. You don’t have to do anything. You literally don’t ever have to touch the lighting. Give us a call to talk about outdoor lighting for your commercial or residential application.